When it comes to buying second homes, shoppers often flock together. 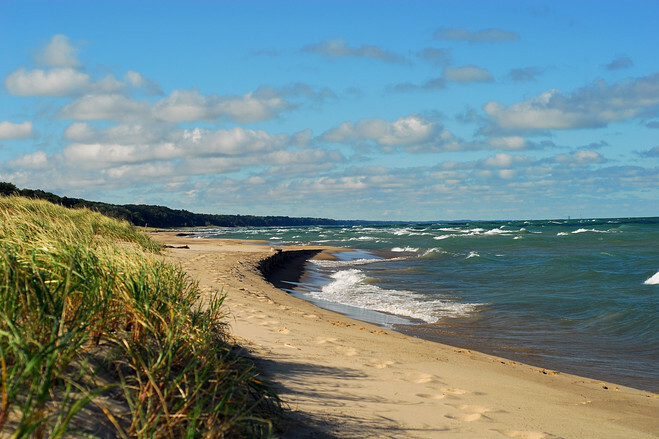 Here is why Chicagoans are crossing Lake Michigan, California tech execs are hitting the beach in Tahoe and New Yorkers are heading south. “A lot of them are buying now because Miami has really changed over the last couple of years, with a ton of New York restaurants and hotels opening up, with new development, and that has really made New Yorkers more comfortable with purchasing,” says Vanessa Grout, chief executive of Douglas Elliman’s Florida brokerage. She estimates that about 60% of her firm’s luxury buyers are from New York, about double the percentage of a year ago. Edgardo Defortuna, president and founder of Fortune International, a Miami development firm, says New Yorkers now make up about 25% of all luxury buyers, compared with around 10% a year ago. At Faena House, a condominium development with 10½-foot-tall ceilings and wraparound terraces, an 18,253-square-foot five-bedroom penthouse was just listed for $50 million. Over 25% of the project’s 47 units are already under contract; 80% of those buyers are New Yorkers. “Miami Beach has never before seen prices like these, but New Yorkers have,” says Oren Alexander of Douglas Elliman, who is handling sales for Faena House. New Yorkers have long targeted Miami, but brokers say today’s buyers aren’t snowbirds looking for a place to retire, but often younger people who partied in Miami Beach in their 20s and now want a vacation home for their families. When visiting family in Miami over a long weekend last February, Andrea Van Tuin, 41, and her husband decided on a whim to look at possible vacation homes. Two days later, they signed a contract for a 2,000-square-foot three-bedroom unit at Paramount Bay, a condo building with floor-to-ceiling windows and water views that, at the time, was still under construction. “We stepped into the model unit and just fell instantly in love with the views—it was a total impulse buy,” says Ms. Van Tuin, an interior designer who splits her time between Miami and New Rochelle, N.Y., after living for many years in Manhattan. The new presence, brokers say, is having a radical effect on the high-end market, which until recently had been struggling owing to the global financial crisis and an overabundance of inventory. The average cost of a luxury condo in Miami increased by 32.6% in the fourth quarter of 2012 compared with the previous year, according to real-estate appraiser Jonathan Miller. At the Residences at the St. Regis Bal Harbour, which opened in 2006 with condos priced from $2 million to $11 million, sales slowed with the economy. “Sales were completely stalled there until December,” says Bryan Sereny, a broker with Miami-based Zilbert International Realty who has sold several apartments there. Jim Cohen, vice president of sales for the St. Regis Bal Harbour, says activity began picking up in 2011 and has continued to increase, with 77 units selling in 2012 and 38 units selling in the first three months of 2013. Meanwhile, pricing on some units has increased by as much as 30%. In January, hedge-fund manager Ken Griffin paid $27 million for a 7,100-square-foot condo in the Setai on Miami Beach—the highest price ever paid for a condo in Southeast Florida. That record was broken a little over a month later when a pair of penthouses at Ian Schrager’s new condo project, the Residences at the Miami Beach Edition, went into contract together for $34 million. People familiar with the latter transaction say that the buyer of those penthouses, also an American, edged out Cantor Fitzgerald Chief Executive Howard Lutnick in the sale by making a quick all-cash offer. Mr. Lutnick declined to comment. Mr. Schrager, who will unveil the Edition next year, says that seven weeks after opening the sales office in January, he sold out more than half of the project’s 26 units—mostly to domestic buyers, for an average of more than $3,000 a foot. “It was a real risk to open with prices that were 200% higher than the market,” says Mr. Schrager. Now, after a slowdown, Chicago’s luxury buyers are returning to Second City’s longtime second home. 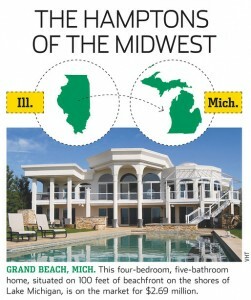 Roughly 80% of its vacation properties are owned by residents of the Chicago area, according to real-estate agents, including such high-power figures as the Daley family, Mayor Rahm Emanuel and former Obama adviser David Axelrod. While the real-estate slump hit both sides of the lake hard—some estimate that lakefront prices fell 25% to 35% during the worst of the recession—luxury buyers began returning to Harbor Country last year. Now brokers say high-end inventory is running low. Last year, 25 beachfront properties sold, five times the amount in an average year, brokers say. In January and February, seven properties priced above $1 million sold or went into contract, says Dan Coffey, a broker with RE/MAX Harbor Country in Union Pier. One sale—a 6,000-square-foot, six-bedroom, six-full-bathroom, shingle-style beach house on 2 acres, with 200 feet of lakefront—topped $4 million, a level not seen since 2005. “You can already feel that the market has turned,” says Donna Iwamoto with Coldwell Banker Previews International in New Buffalo, Mich. She and her partner, Karen Strohl, have already sold $25 million in real estate this year. Harbor Country is considerably more low-key than its Hamptons counterpart. The hub of the region is New Buffalo, an unpretentious beach town 70 miles from the Chicago Loop. An Amtrak line runs on a single track through the center of town, providing connections up to three times a day to Chicago and Detroit. For regulars, the season gets going when roadside burger place Redamak’s opens March 1, or when visitors start queuing up for ice cream outside Oink’s Dutch Treat. Family traditions thrive, including farmer’s markets, ice-cream socials and a July Fourth children’s bicycle parade. As with the condos on Chicago’s ritzy Gold Coast, the most prized homes front the lake, and are often set above the shoreline to offer unobstructed views. Many high-end homeowners enjoy their own backyard beaches, or access to a community beach, where on a clear summer evening they can watch a 9 p.m. sunset behind the Chicago skyline. The links across the lake go back more than a century. In the early 1900s, the quiet village of Lakeside, north of New Buffalo, became a playground for industrial magnates and University of Chicago professors. Working-class vacationers, too, enjoyed a wooded, breezy refuge from Chicago’s steamy summers. As in the wards of Chicago, ethnic vacation enclaves emerged on the Michigan side as well—Irish Catholics in Grand Beach, Jews in Michiana, Lithuanians in Union Pier. To this day, some of the most expensive homes in the region sit alongside smaller cottages, giving many neighborhoods an eclectic feel—and putting some luxury buyers off. 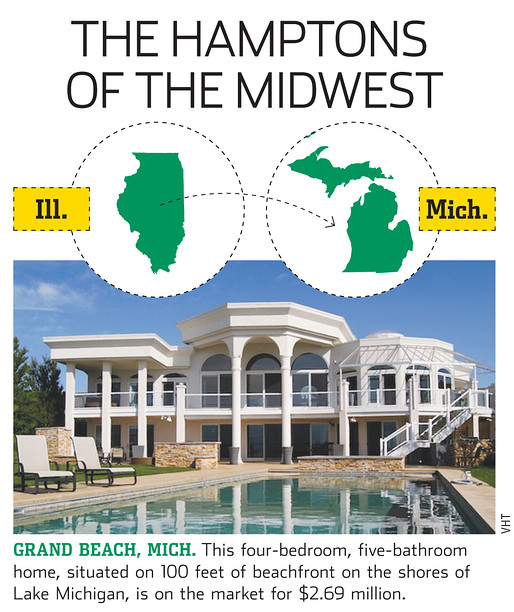 Stacy Daniels, a retired patent attorney from the Chicago suburbs, and her husband listed their five-bedroom, four-bathroom home in Harbert, with 104 feet of private beach frontage, for $3.495 million. After 11 years, they say they’re ready for a new adventure. Once the home sells, the couple say they may go elsewhere—or just stick around and buy another home to be near their 15 grandchildren. The hottest new tech-industry accessory? A house in Tahoe. Venture capitalist Steven Stull recently paid $11.875 million for a 10,000-square-foot waterfront estate on Lake Tahoe in Incline Village, Nev. David Duffield, co-founder of Workday, paid $25.5 million for another Incline Village estate, according to public records. It was the largest sale on the Sierra Nevada lake since 2008, says listing broker Kerry Donovan. Brokers in towns surrounding the large freshwater lake, which spans the border of California and Nevada, say sales have picked up dramatically in the last six months, as spillover from the Bay Area’s exuberant housing market has finally reached the area. The Nevada side of the lake has gotten an additional boost since California passed Proposition 30, hiking income taxes on the wealthy and increasing the appeal of owning on the zero-income-tax Nevada side. Brokers say sales are surging on both sides of the lake. “December was the strongest December we’ve ever seen in the business,” says Susan Lowe, the corporate broker for Chase International, pointing to data that stretch back to 1990. According to the agency, the first quarter of 2013 saw $246.4 million home and condo sales in the area, up more than 70% from the first quarter of 2012. Jim Telling, a partner at East West Partners, which developed the Village at Northstar, says the company has seen a 72% increase in the number of home sales since 2011. Average prices rose to $869,000 from $531,000, spurred by a large number of $1 million-plus sales. The change in the area’s fortunes has been swift and dramatic. Though the housing market in the Bay Area has been one of the strongest in the country, Lake Tahoe long struggled to recover from the downturn, with homes frequently sitting on the market for many months and selling well below asking price. Despite the recent boom, prices still have yet to recover to their predownturn heights. Ms. Lowe says pricing generally dropped about 35% from the peak and is coming back slowly. Martis Camp, a golf and ski community in Truckee that began construction in 2006, has sold 52 lots and homes since the start of January, says Brian Hull, director of sales, up from 27 at this point last year. Prices for lots range from the mid-$600,000s to $2 million and 108 homes have been completed so far. Mr. Hull says the influx of younger families from the tech industry has resulted in a number of contemporary-style mountain homes with glass-filled architecture. 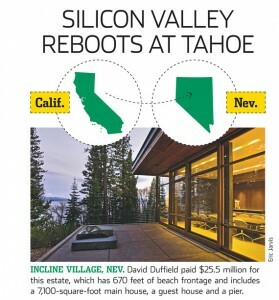 Ms. Donovan, a broker with Chase International in Incline Village, the Nevada town where Oracle ORCL -1.01% billionaire Larry Ellison has assembled a 7.6-acre lakefront compound, says Proposition 30 has had a positive impact on sales on the Nevada side. Though several high-profile sales have gone to tech-industry people, she says, the typical buyer is a wealthy baby boomer in finance or other industry from Northern or Southern California looking to relocate. “People are thinking, ‘OK, I’d better just do it now,’ ” she says. To view this article in its complete version, please visit the original post at The Wall Street Journal website.